Chicken Cabbage Salad with Basil and Kumquats is guaranteed to be your favorite salad for summer parties. The unexpected combination of flavors results in a phenomenal salad that everyone devours. I felt so honored when I received an invitation from Bertolli Olive Oil, the number one oil brand in the world with over 150 years of expertise in olive oil blending, for their campaign “The Recipe is Simple” and I accepted it without a doubt. I’m glad I did because Bertolli inspires simple yet unexpected dishes. I’ve been really busy these days and I’m already in search for simple recipes. There was another point I found attractive and challenging in this Project (I do love challenges in cooking!). They wanted me to create a simple recipe using five must-have ingredients ( Bertolli Organic Extra Virgin Olive Oil, chicken or Jackfruit, one purple produce, basil and kumquats) and one additional ingredient of my choice. It’s quite challenging, isn’t it? As a working mom, I love to create quick and simple salads that make perfect lunch or dinner for my family, I knew I would join this campaign with a salad. On the other hand, I had never combined those ingredients in a recipe before, so I was a bit worried. Then I remembered a super easy purple cabbage salad mom used to make very often when I was living with my parents. It was never enough because we would gobble it up even before the main dish. Inspired by her amazing recipe, I decided to pick lemon juice as my additional ingredient and make this Chicken Cabbage Salad with basil and kumquats. I’m glad I did because my family LOVED it when I made the salad to test the recipe first. Although cabbage, chicken, kumquat and basil sound like a weird combination, I can proudly say that this is one of the best salads I’ve ever made. A lunch or dinner for a family couldn’t be any easier than this chicken cabbage salad. What makes it that tasty is the marinade I use for the shredded purple cabbage and the chicken pieces. Plus, Bertolli Organic Extra Virgin Olive Oil is non-GMO and verified USDA Organic, made from organic olives and produced using organic farming standards. The marinade is the key to a mouthwatering purple cabbage salad. 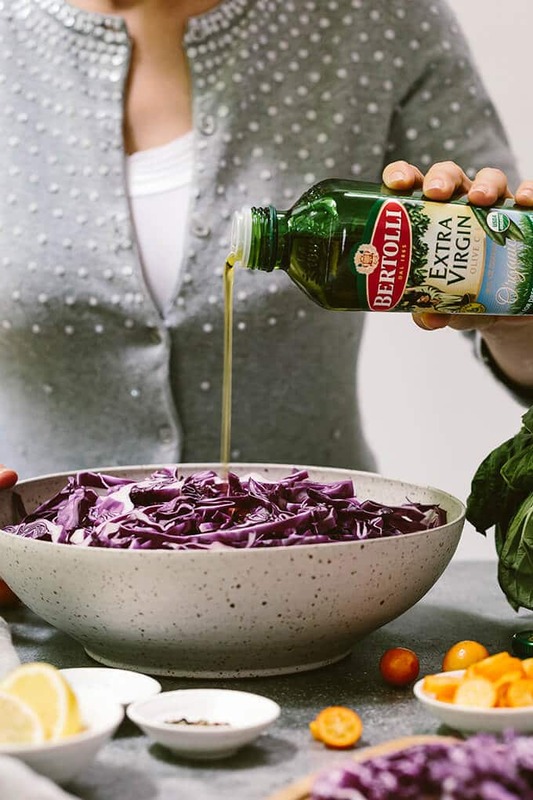 Sprinkle salt on shredded cabbage and add in freshly squeezed lemon juice and Bertolli Organic Extra Virgin Olive Oil. Massage the shredded cabbage well so that it starts to wilt thanks to. Refrigerating it at least for half an hour is okay, but I suggest that you chill it overnight. The olive oil and lemon juice will be perfectly absorbed by the cabbage, so it will get tender and as appetizing as your favorite pickles. Plus, it will have a brighter color, which makes it look even more attractive. How to make chicken marinade is another significant point in this recipe. Are you ready for the easiest marinade ever that you can use for any chicken? You need only 3 ingredients; Bertolli Organic Extra Virgin Olive Oil, salt and ground black pepper. Pour this mixture over chicken pieces, cover and let it sit in the refrigerator at least for 3 hours. Overnight would be the best. This olive oil marinade helps the chicken gets wonderfully tender when cooked. I think the recipe for this Chicken Cabbage Salad gets even simpler when you make the cabbage and chicken marinades overnight. Your dinner is ready in a few minutes the next day. Since the chicken cubes are already marinaded with Bertolli Organic Extra Virgin Olive Oil, you don’t need to add any oil in the pan. Cook them in a very hot pan until both sides are cooked but they are still juicy inside. It is better to cook them in batches. If you overload the pan with chicken pieces, they release water and they will be steamed, not grilled or roasted, which you might find boring in taste. Basil and kumquat not only give the salad super charming colors, but also a super refreshing effect, which is perfect for hot summer days. Also, you can always squeeze extra lemon on the salad right before serving. Simple, tasty and healthy chicken cabbage salad is a recipe you need to add to your repertoire! It will be your family’s favorite go-to salad. Put shredded cabbage in a bowl. Sprinkle salt over it and add in lemon juice and Bertolli Organic Extra Virgin Olive Oil. Massage it well. Cover and refrigerate at least for 30 minutes. Overnight would be the best. Put chicken pieces in a bowl and add in Bertolli Organic Extra Virgin Olive Oil, salt and pepper. Massage them a bit. Cover and refrigerate at least for 3 hours. Overnight would be the best. To assemble the salad, put the marinaded cabbage in a bowl, top with chopped basil and thinly sliced kumquats. Meanwhile heat a pan and cook chicken pieces until both sides are golden, flipping them over after 3-4 minutes. It’s better to cook them in batches to avoid steaming them. Place the cooked chicken pieces on the salad and serve. What a great recipe! The combination of flavors sound and look so SO beautiful. This is a must try! Thanks honey! It makes a perfect quick weeknight dinner with simple ingredients!